Judge has a history of giving funds to pro-Israel organizations. 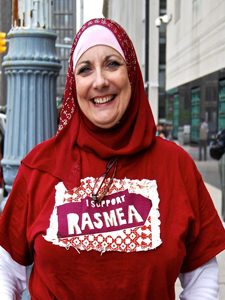 As Rasmea Odeh’s supporters packed the courtroom for her hearing in the U.S. District Court in Detroit on July 31st, they heard Judge Borman refuse to step down from the case even though he has a history of giving funds to pro-Israel organizations. At the beginning of the hearing, Judge Borman indicated that he “had reached a decision on the recuse motion ten minutes ago” and the decision was distributed to the attorneys. Quickly, the Judge shifted to technical matters regarding the defense motions needing to be resubmitted separately “as is the standard procedure for the Detroit district”. But the biggest issue discussed was the defense motion to include for the jury an expert witness who has stated that Odeh suffers from Post-Traumatic Stress Syndrome (PTSD) as a result of the torture suffered in the Israeli prison. The defense contends that Odeh was suffering from PTSD at the time of her completion of the immigration application – affecting her psychological intent in supplying the answers that she did. The government prosecutors deny that this expert testimony is necessary or relevant to their case against Odeh. They also indicated that they would want to provide their own expert witnesses if the judge ruled the testimony admissible. This will be an important ruling as if it is allowed to go ahead, it will also become part of the jury instructions for deciding the case. Given Judge Borman’s pro-Israel background, it is hard to imagine that he would allow even a discussion of Israel’s torture of Palestinian detainees in a U.S. court. The next steps are a hearing on September 2 to resolve all of the defense motions that have been submitted to the court. If everything is resolved at that time, her trial date will be September 8. Whether the trial starts then will likely be dependent upon whether the expert testimony issue can be quickly resolved. 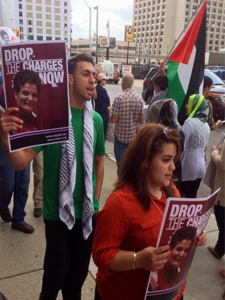 After the hearing, Odeh’s supporters continued to picket outside the courthouse and spoke of their determination to return in even larger numbers for the September 2 hearing and the September 8 trial. Michael Deutsch had the last word.